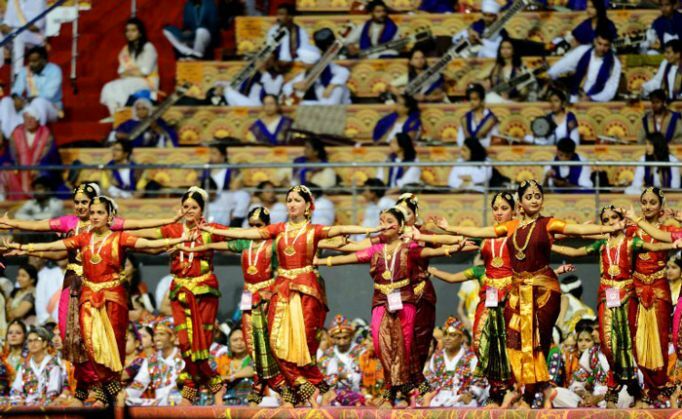 Art of Living's World Culture Festival was supposed to be a celebration of the 'power of peace'. Instead, it turned out to be nothing less than a nightmare for us artists, who had to endure the heat, rain, hail and cold - all in one night. And if you thought nature's fury was all we had to face, think again - we had to endure appalling transportation arrangements, which left us harassed and our loved ones fearing for our well-being. In India, we seem to take for granted that events will be badly organised, and people will refuse to comply with organisers' requests. But I beg to differ. When you build such a massive stage at a huge cost on marshy land, the least you could expect Art of Living to do was ensure that, of all things, water wouldn't destroy what they were trying to accomplish. The 300-metre stretch from the greenrooms to the stage wouldn't be a pleasant stroll even in broad daylight and on dry land. But add to it the swampy terrain and the Friday afternoon showers, and the evening was like an expedition up a mountain in total darkness. All the participants were brought on to the gigantic seven-acre stage at around 3 pm. The event was to start at 5pm, after which, we were supposedly allowed to leave. Evidently, things did not go according to plan. Showers had been forecast for that afternoon, with some hail expected. Yet, no measures were taken to prepare for this eventuality. As the piercing sun gave way to clouds, fat drops of rain came pouring down on us at around 5pm. There's one simple rule that one must follow before any performance: don't get wet. What happened was exactly the opposite. With no provision to shelter us from the rain, all the artists were left on stage to be soaked by the rain, and then eventually perform on the wet surface that got more dangerous with every foot that stomped on it. Sure, the organisers gave us plastic bags to cover ourselves with. But did every person get one? Nope. Were they handed out on time? Again, no. Credit must go to the artists and their discipline. Sure, there was a considerable amount of tripping and tumbling, but the artists were quite accommodating towards each other. We simply held hands with others in the group and walked in human chains back towards the greenrooms. That unity was probably the only highlight of the night. Ironically, the rain was one of the smaller problems we encountered. I was part of the Bharatnatyam entourage, which left the stage immediately after our performance at 7pm. Just when we were ready to leave the festival venue, we were informed that our bus had not arrived. We were still willing to wait, but by 10pm, when transportation was still nowhere to be found, many of us began to lose our patience. Restless, tired and at our wits' end after a terrible day, we found ourselves lugging around our costumes and jewellery and waiting for the nonexistant bus at the gate where it was supposed to be. Imagine our parents' plight - their children were walking through puddles of mud in the middle of nowhere, with no idea of when we would be back. We started getting frantic calls from parents, who had been waiting at our dance school for over three hours at this point. At around 11pm, after contemplating many possibilities, we got onto another Art of Living bus, which dropped us to another gate, where we found our wonderful bus driver standing. Thankfully, he was willing to take us to the spot where we had told our parents to come, and so, at midnight, five hours after our five-minute performance got over, we found ourselves making our way to the safety and comfort of home. There are some experiences in life you know you will never forget. For me, this was one such experience. It was my first time performing at a large event, and I expected it to broaden my horizons. I definitely learnt a lot of things this Friday. But were any of them positive? Maybe once the scary and surreal bits of the experience subside in memory, I will be able to think of something constructive I may have learnt that day. For now, the turmoil is all I can remember, and I can think of.